1. Combine half the oil, 1 tablespoon balsamic vinegar, sugar, garlic and smoked paprika together. 2. Coat beetroot in half the balsamic mix and place in a baking paper lined baking dish. Coat pumpkin in remaining balsamic mix and place in a separate lined baking dish. Bake at 180°C for 30 minutes or until tender. 3. Combine remaining olive oil and balsamic vinegar, parsley and seasonings to make a dressing. 4. Toss cooked vegetables, rocket and dressing, until well coated. 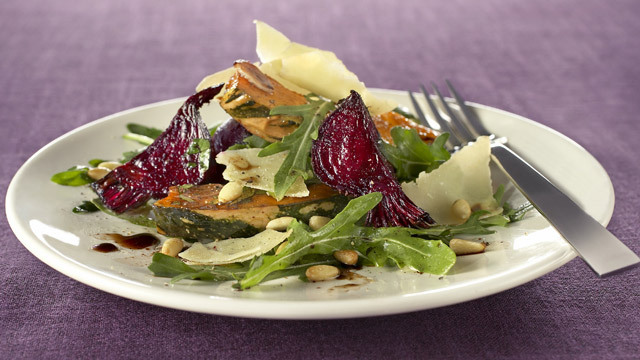 Divide between serving plates and sprinkle with pine nuts and Shaved Parmesan. Use a vegetable peeler to shave Perfect Italiano Parmesan Wedge over this salad in place of Perfect Italiano Shaved Parmesan. This entry was posted on August 2, 2010 at 7:20 am and is filed under Cooking, Family, Friends, People, Personal, Recipe. You can follow any responses to this entry through the RSS 2.0 feed. You can leave a response, or trackback from your own site. Looks delightful and low calorie. Beets are very good for us. I love them. Thanks for a great recipe. We are going to dinner at my brother’s house, so we’ll be eating some gourmet cooking. Yum! Oooh hah! That looks good enough to eat!